Think of the Crusher Street Sleeper III Air Cleaner as a heavy-breathing wolf in sheep's clothing. This unit includes a high-flow K&N washable and reusable filter element, and features integrated crankcase breathers to eliminate the need for external hoses and fittings. The high-flow filter element is compatible with factory Harley-Davidson air cleaner covers to maintain a stock appearance, with front-end and outer perimeter breathing for a significant boost in airflow. Includeshigh-flow washable and reusable K&N filter element. Compatible with stock'99-up oval air cleaner covers, as well as'14-up rounded Touring covers. Internal breathing eliminates external hoses and fittings. Front-end and outer perimeter breathing for drastic increase in airflow over stock. 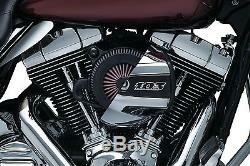 Stock Harley-Davidson Air Cleaner Cover NOT INCLUDED. Fits: 08-'16 Electra Glides, Road Glides, Road Kings, Street Glides; Trikes,'16-'17 Softail. 11-'12 FLSTSE,'13-'14 FXSBSE,'14-'15 FLSTNSE. 08-'16 Electra Glides, Road Glides, Road Kings, Street Glides; Trikes,'16-'17 Softail,'16-'17 FXDLS,'11-'12 FLSTSE,'13-'14 FXSBSE,'14-'15 FLSTNSE. Before you unwrap your parts double check your fitment and once unwrapped, look the item over before trying to install it. If an item is out of stock or oversold the customer will be notified of the date that the item will be back in stock. The item "Crusher By Kuryakyn Street Sleeper III Air Cleaner for Harley TBW Models" is in sale since Tuesday, May 10, 2016. 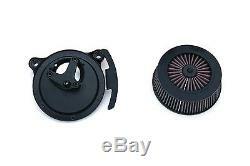 This item is in the category "eBay Motors\Parts & Accessories\Motorcycle Parts\Air Intake & Fuel Delivery\Air Filters".